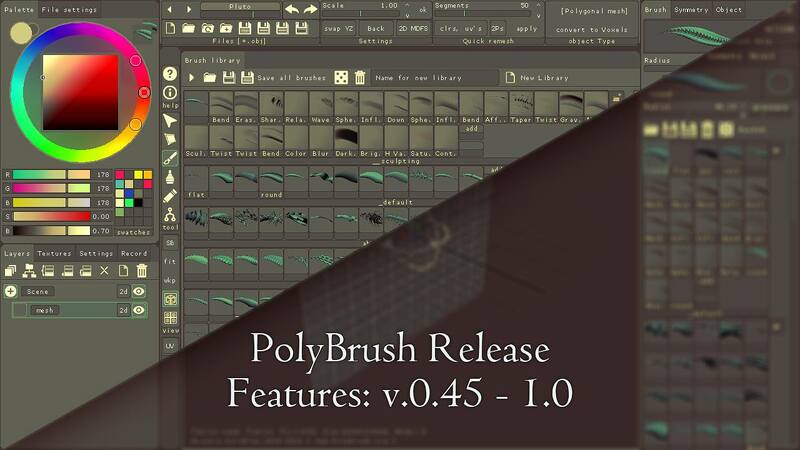 [ #Polybrush ]After 5 month of Free beta testing, Arseniy Korablev has annouced that Polybrush 1.0 is now available with two version Full and Lite. -Position is defined now by rotation angles, not using vector. So you can choose angle using the sliders at panel. -Ability to separate whole scene to cells like in game map editors. It enables in Snap\World Divs\. In this case workplane reset will move it to center of most closest cell. -Now you can draw inside remesh, so to speak. Use all brushes or other tools and remesh be applied after each stroke. -To covert object to voxels use button with that name at 'Object' panel or at Top of ui. Remesh smoothing also working for voxels. -You can record Polybrush window without using third party software. -Huge convenience of such recording is that you can adjust the speed when drawing, when the cursor is outside the viewport, and it automatically pauses if you don't move cursor. -And most importantly, when you press CTRL + Z required part of video is removing together with the canceled action (if necessary). -Solved problem with normals export. Previously, after importing objects from Polybrush some normals could be directed in the wrong direction. -If the problem persists with the old scenes, it can be solved, using modifier Normals/Quad Reverse parameter. -You can seperate object to separate parts by one click - Object/Explode. For example if you drawn chain using brushes and want to separate it to chain links. -Appeared not a perfect but an easy way to export Polybrush vertex colors as texture to other programs. -There are texture: Polybrush\Data\All_colors.png with all possible colors, Brightness value - by vertical, Hue value - by horisontal. Saturation is same at all image. -When export (if it enabled in File settings) texture UV-coordinates for every vertex is defined as: U is brigthess value, V is hue value. -So when you import polybrush model in other software you can just assing All_colors.png texture to it to assign Polybrush colors. -But saturation will be identical, equal to 100%. It's better to change texture saturation to the desired value. -All Polybrush settings, ui theme, colors swathes are saved when restart. You can download Polybrush 1.0 Full Edition for $20 / year, (30 day free) or Free Lite Edition here!